Stephen Colbert jokes about #CancelColbert: "The system worked!" Stephen Colbert is dealing with the fallout from a tweet sent out on his show's behalf -- and doing so on-air by imagining his show really getting cancelled. Last week, the Twitter feed @ColbertReport, affiliated with the Comedy Central series, tweeted an out-of-context joke from a segment mocking the Washington Redskins' owner and his attempts to reach out to the Native American community without changing his team's offensive name. The #CancelColbert hashtag immediately caught fire, and Colbert opened his show by depicting the studio shutting down... his writers walking out dejected... Manhattan freezing over... the famous 1970s-ad Native American shedding a single tear... all manner of dystopia. The actor B. D. Wong, himself Asian, appeared as a therapist of sorts to explain to Colbert, dressed in Redskins regalia and lying on a couch, that he was having a horrible dream. "This is still 'The Colbert Report,'" Colbert announced. It was, all in all, a pretty audacious gambit -- to openly mock those who'd sought to get Colbert fired by rubbing in their face that it'd never happen, and to bring in one of America's most prominent actors of Asian extraction to aid in a non-apology. In his opening monologue, following an audience chant ("Ste-phen! Ste-phen!") Colbert joked about how offensive it was that his shoes were made in Vietnam (rather than in China) and how upset he was that iPhone's emojis are growing more diverse thanks to the "P.C. police." And, yes, Colbert directly addressed the controversy: In a segment called "Who's Attacking Me Now," Colbert joked that "we almost lost" and then went through just how the controversy went down, through a sort of mirror-world reality whereby "Colbert," the conservative on-air persona, saw his attempts to support his fictitious and racist alter ego get misinterpreted online. Then he compared himself to Jonathan Swift. If you're not a Colbert stan of the sort sitting in the audience and cheering him on, it kind of made no sense. The thing got rolling a bit later on, but there were too many issues of persona at play -- Colbert, in pompously defending himself as "Colbert," seemed to be truly self-aggrandizing, in real life, describing the degree to which he'd been vilified by the news media, running through the tweet going up and being read out-of-context as proof "the system worked!" Poor guy. It seemed as though Colbert was seeking to prove just how far he could go both before and after he directly addressed #CancelColbert -- to make a lengthy joke sequence about how white men should be society's, and emojis', baseline before your non-apology is to show you don't really care. 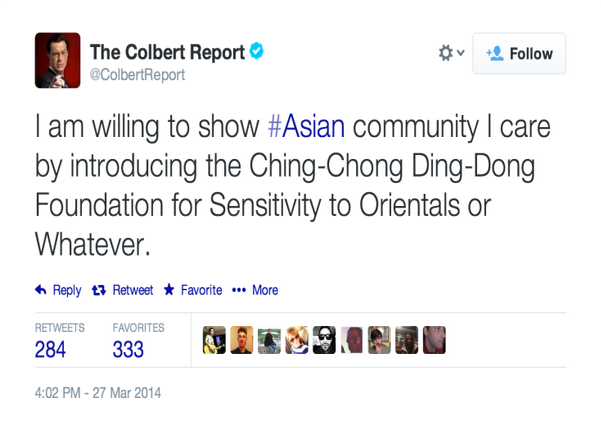 To his credit, he urged his fans to stop attacking activist Suey Park, who started #CancelColbert. Updated: In an interview segment, Colbert thanked Twitter co-founder Biz Stone "for dropping everything and flying in from San Francisco to apologize to me." The pair discussed the history of the hashtag -- an element of Twitter Stone hadn't liked at first -- as well as Twitter's history of bringing down tyrants. Noting that Twitter had brought down a number of tyrants, Colbert asked "Am I now the most powerful man in the world?" As usual, the impact of the comedy was dulled -- or heightened -- by the audience loudly chanting his name. The second segment of the interview was about Stone's new book, called "Things a Little Bird Told Me," and new app, called Jelly; the controversy was almost entirely forgotten. Almost." How will this app," Colbert asked, "be used to try to get me fired?"